The vision of the Criminal Justice Council is a fair and effective criminal justice system. The Criminal Justice Council engages in a collaborative process of information sharing to maximize resources resulting in an enhanced criminal justice process. This work is done through utilizing research-based practices to ensure community safety through the promotion and support of intervention for at-risk youth and adults, addressing victims’ needs and reduction of recidivism. In 1993, the Dutchess County Legislature passed Resolution #61 that established the Criminal Justice Council (CJC) as "necessary to support an efficient and effective criminal justice system." the 1995 jail addition of 100 beds. In Resolution No. 29 of 1998, the Legislature further defined the structure of the Council by adding an additional legislator from each caucus, bringing the total number of legislators to four. In 2011, Resolution No. 2010111 created an Executive Committee with a defined membership and duties. The Resolution established an Executive Committee to "set strategic direction to ensure the Council's work to address its mission, analyze criminal justice system policies, assign tasks to sub-committees and make recommendations to the County Executive and Legislature." As outlined in the local law, the Criminal Justice Council may advise the county government in such matters as relieving jail overcrowding, improving case processing and encouraging the development of ATIs as appropriate. However, the Criminal Justice Council does not oversee the internal operation of any agency nor does it create criminal justice policies. The Criminal Justice Council may issue reports to the County Executive and Legislature as requested. The Council also serves as the county’s ATI Board and functions in a manner consistent with state ATI Board requirements. During 1998-1999, the Criminal Justice Council worked with the National Institute of Corrections (NIC) as one of ten national sites to develop a strategic planning process. The local law creating the Council permitted the adoption of additional roles and procedures as are necessary for the efficient and orderly conduct of its business. This allowed the Council to adapt as it evolved to meet changing needs. The County Executive appoints a county department to act as the lead agency to the Council; this is currently the Office of Probation and Community Corrections. Consistent with its role as lead agency, the Office of Probation and Community Corrections presents the annual budget and is the oversight agency for consultants and any county contracts and may provide additional administrative support as needed. consultants and is the spokesperson for the Council. The chairperson sets agendas and facilitates meetings of the Executive Committee and the Council. The Executive Committee meets monthly (except August) and functions as the steering committee for the Council. It oversees and guides the work of the Council and its committees, establishes strategic direction and analyzes available data to ensure decision-making is informed by research. A consultant was hired in 2012 to assist the Council to access and analyze data for planning and research purposes. An Administrative Coordinator facilitates operational functions for the Council. The Criminal Justice Council normally meets six times annually at 8:00 a.m. on the second Tuesday of the following months: January, March, May, July, September and November. Meeting schedules and locations are posted on the county’s website and are subject to change. Meetings are open to the public. The public may comment following Council meetings at the discretion of the chairperson. Special meetings may be called with at least five days notice sent by mail, phone or electronically. Meetings may be cancelled by the chairperson for good cause. The Criminal Justice Council uses Robert’s Rules of Order. The Council strives for consensus in decisionmaking, but voting is decided by a simple majority of those present at the meeting. The chairperson may request a new appointment or replacement of any member who has not attended meetings for one year or who expresses a desire to resign. 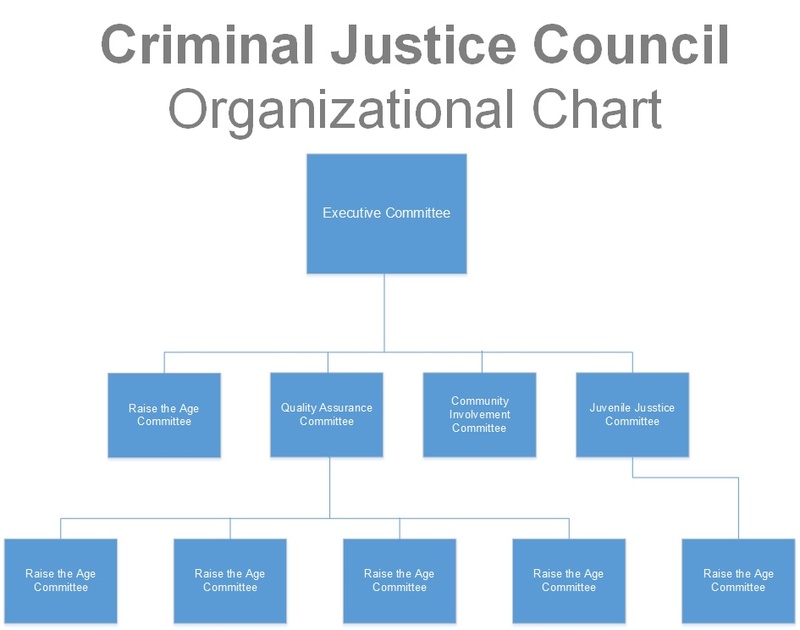 Much of the work of the Criminal Justice Council is conducted at the committee level. In addition to standing committees, special workgroups may be formed to study and report on a specific issue that is time limited in nature. Over the life of the Council, committees have been created, and sometimes abolished, depending on the needs of the Council. Currently, there are nine standing committees: Community Involvement, Diversion, Juvenile Justice, Quality Assurance, Raise the Age, Re-Entry, Special Populations, Victims and Women Involved in the Criminal Justice System. Each committee has a chairperson who sits on the Executive Committee. Membership on the Council is determined by Legislative Resolution and includes both standing members and appointments for two-year terms. In addition, committee chairs are members of the Council by Resolution as well.